Q. How Many People Attend The Annual Online Course? A. Totally varies. Biggest group has been around 40. Smallest group has been 7. Usually somewhere in between. Sometimes people register but due to time zone challenges or busy schedules participate via watching the recordings and posting in the forum rather than being live on every webinar. A. There is usually a nice range of folks who are attracted. From different geographies, backgrounds and ages (although most are in the 35-60 range). Primarily woman however men do participate too although for some reason they tend to choose private coaching more than the group coaching option. Also, given the nature of my work and who I am, I attract people who are creative, intuitive and/or spiritual (whether that quality is conscious or unconscious in them). I also attract fellow Process Professionals (consultants, coaches, therapists, counselors, facilitators, teachers, trainers, scribes, etc.) 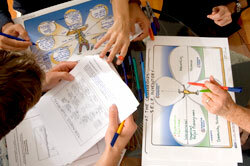 some of whom take this program to satisfy one of the pre-requisites for Visual Coach Certification®. Q. What Kinds Of Results Happen? A. My job as your Coach is to create a powerful, safe and skilled container for you to do your inner work in. As an adult learning experience, the results you get depend on you. 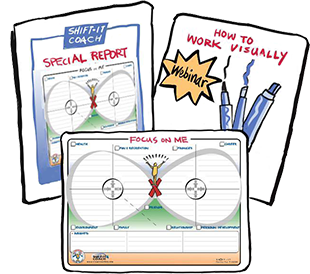 I’ve facilitated over 1000 people through my SHIFT-IT System® … and now with my Certified Visual Coaches those numbers are growing rapidly across the world. Some people choose to focus the SHIFT-IT System on their personal life: improve or end relationships, manifest new ones, get pregnant (10 SHIFT-IT babies so far! ), make more friends, adapt to life after the loss of loved ones, etc. Others focus on the work arena (change jobs, go solo or create small businesses, attract biz partners, use the internet more effectively to attract and boost client volumes, etc.). Enhancing prosperity is another popular SHIFT-IT focus (increasing income, paying off debt, accumulating assets, coming into unexpected windfalls, etc). Another popular area is body and health issues (lose weight, increase fitness, enhance sensuality and sexuality, address health conditions etc). Schooling sometimes comes up (returning to school, choosing and completing degrees, helping family members with education goals). Real estate related stuff also pops up quite a bit (finding, buying, selling, building, etc.). For others, its not about tangible things per se but more about creating a better feeling and vibe in their life overall (security contentment, optimism, adventure, connection, etc). Finally, people at end of life use SHIFT-IT to ready themselves and their loved ones for their passing. From the testimonials from past SHIFT-IT participants you can see the range of people and SHIFTs that occur through this powerful process. What are the “ITS” you want to SHIFT? Come, we’ll help you make them! Q. When Will You Offer This Course Again? A. SHIFT-IT Online is now only offered ONCE A YEAR, usually at the beginning of the year. There is also a Home Retreat Kit that is available at any time, if you don’t want to wait for a live class. Or you can work privately with me or one of our Certified Visual Coaches. Q. What Is The Home Retreat Kit Option? A. 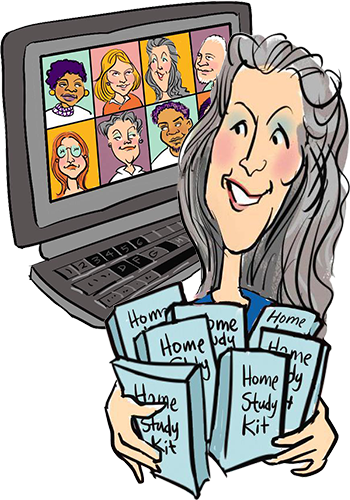 The Home Study Kit contains the same information as the live course (in fact you watch a live online course and follow along as they go through the material). This Kit allows you to access the course from the comfort of your own environment and control the pace and timing of your integration. Great for people who ‘want it NOW’ and/or who can’t attend the live webinars for various reasons. The Deluxe Level of this Kit comes with three private coaching sessions with Christina. Remember that as a Kit Purchaser you are welcome to do the Annual Live Course anytime as a Free Repeater. Q. Do I Have To Draw To Participate? A. No, you don’t. My SHIFT-IT Maps are the foundation of this program. They are structured templates (forms) that you fill in with your reflections, thoughts, feelings and insights. The drawing is already done for you. How you choose to fill the SHIFT-IT maps in is totally up to you (it’s not an art contest, its thoughtful depth work we are doing). Simply printing or writing on them is totally fine. It’s only you who needs to be able to decipher them. However, if you are comfortable with doodling, drawing, coloring, etc. (or it intrigues you to give that sort of thing a try) then you are welcome to weave in your own creativity in whatever way makes you feel good. Even though I am known for my visual approach I am not the greatest artist. I keep my own graphics pretty simple (choosing instead to focus on content capture and reading the energetic blueprint of my clients). Chances are there will be people in the course who are talented creatives. And you can join me in ohhing and ahhing over their creations without feeling like you have to perform at the same level. To each their own. Q. Do I Have to Divulge My Private Stuff? A. The amount and depth of your personal self-disclosure is totally up to you. You can attend the SHIFT-IT Annual Course without sharing anything about your own specifics. Yes, I will occasionally be working with people in the group calls as demonstrations. But I will only be working with people who are comfortable volunteering (thankfully there are always plenty of extroverts willing to jump right in!). I will also be using myself and my own journey as examples. The bulk of your work during this event will be done on your own – in-between calls using the SHIFT-IT maps and materials. You are encouraged to upload your Maps into our private forum. However your level of participation in the private forum is totally up to you. After doing this group for years, I find that some people’s initial reluctance to participate publicly dissipates as the group progresses – a very pleasant, safe and enjoyable container is created – with many new friendships being forged. That said, if you really aren’t a group person, then private coaching with me one of my Certified Visual Coaches® is a better option. A. I like it when people ask me this question as it allows me to address several important things. First off, no, my SHIFT-IT System is not religious. Although people from many different faith traditions have participated over the years and I welcome and cherish that diversity. SHIFT-IT is about deeply, honestly and courageously looking at yourself and your life. It’s a very powerful experience that creates change, sometimes great change, depending on you and your crossroads. People often are attracted to it when they are dissatisfied and need change. Or when they are happy yet desire more. SHIFT-IT helps them do that. In a way, it’s a sacred process, but not religious. I have been through a lot in my life, as someone who has the audacity to call herself The SHIFT-IT Coach should! 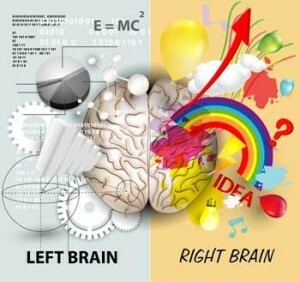 Not only have I had an innovative career path with all that that entails (see My Left Brain Story) but I have also had a pretty unusual personal path as well, including kundalini awakening (see My Right Brain Story). Some people view my whole-brained-ness as a valuable asset they want to tap. Others are more comfortable with one side over the other. Sometimes my work is to introduce people, gently, to the side of themselves that they don’t know so well or have judgments about (i.e. the logical/organized types need to access emotions/creativity and the creative/emotional types need to access logic/organization). 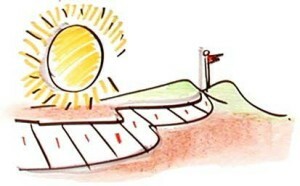 SHIFT-IT’s holistic nature accommodates both sides. Q. Can I Use Your Shift-It Maps With My Own Clients? A. Not through this course only. The Annual SHIFT-IT Online Course and The Home Retreat Kit (and all associated materials) are for your personal use only. I don’t mind if you share them within your household … that is totally fine. 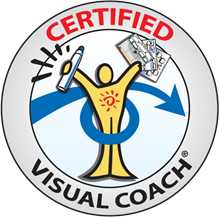 However, if you are a Process Professional and wish to use my Visual Coaching techniques and tools with your own clientele I respectfully direct you to Visual Coach Certification. Q. Can I Work Privately With You Or A Certified Visual Coach? A. Yes! I do work privately with clients, both online and in-person in Victoria, British Columbia, Canada. And I am very proud of the Certified Visual Coaches who are sprinkled geographically across our planet for you to choose from … many of whom work privately with clients and also offer SHIFT-IT In-Person Groups in their regions. A. As the visual way of working grows, the interest in this wonderful way of working is expanding. Given the value of my work and what it produces, and all that has gone into developing it, I do not discount it. Instead I offer generous Seasonal Sales and Payment Plans to accommodate my clientele (so I suggest registering for my eZine in the top left-hand side of the site, to receive announcements when these savings are being offered). I do occasionally offer partial scholarships for people who are genuinely from or serve disadvantaged populations or topic areas. To inquire about the possibility of a partial scholarship, simply email admin@shift-it-coach.com and include a thorough explanation of why you are seeking a scholarship, for which program, and for what amount. I or my assistant will get back to you after I have considered your request.